Delhi Police in association with Dwarka Hello Moms conducted a Ten day Self Defense Training Programme at their center in Pochanpur village for girls above 5 years and women of the area. Self Defense Classes which started on 15 June,2015 had about sixty seven students who participated religiously at the center being coached by the police trainers daily for about two to three hours. They were taught safety measures tips and alerts which can be used in their day to day life to protect themselves. Theoretical and practical sessions were held for 10 days at DHM Centre. Young girls and women candidates showed their full interest in attending this programme and completed successful training of Self Defense Programme given by Delhi Police. This training was given free of cost by Delhi Police. On 26th June, 2015 closing ceremony was held to distribute the certificates to the candidates who successfully completed the programme. Chief Guest, DCP of Dwarka, Ms. Noopur Prasad , SHO Mr. Kamaldeep Singh Rawat , Mr Surjeet and their team of police officials were present. The DCP Ms. Noopur Prasad gave away the certificates to the candidates. Mr. Mukesh Sinha, Mr. S.S.Dogra and Mrs. Suman Sahni VP Of govt Senior Secondary school sector 22 also graced the occasion. Mr. Surjeet Shokeen who monitored the training to the candidates along with his other members from Police Department told in his speech addressing to candidates that self defense i.e private defense in police term, is a legal right of every one. He told that self defense does not at all means that one has to quarrel every time with each one but we have to be alert every time. They were assured help round the clock on the prescribed help line by Police Department. Women candidates were taught to face and tackle all kind of worse situations in their day to day life like, eve teasing, stalking, drug abuse, chain snatching etc. Ms. Noopur Prasad, DCP was pleased to see the demonstration by the trained candidates before her on the day of obtaining certificates. She encouraged them a lot and appreciated this. She also told these girls to continue their self defense practice daily and also told that now as they are not merely learner, but have become teachers also, so they should teach this skill to more and more women candidates around them. Women candidates were told by her that they should not only try this skill to help themselves but should always be ready to help others also, whom they find in trouble . She alerted college going girls to be more careful and told them that they must continue their practice. Candidates were taught to keep their eyes, ears open and smelling sense more alert. In her very useful and precious speech Ms. Noopur Prasad also told these candidates that they should not show them as a weak personality, should always act as if they r confident, brave and alert, and women should try to keep on spreading this message and self defense skill to each one around them. Women candidates were taught, how they can tackle the worse situation on their own, by the time any help reaches them. Women candidates who successfully completed the Self Defense Programme, mentioned that after this training, they have become more brave and confident and can face or tackle any situation. Candidates felt so proud when DCP Ms. Noopur Prasad addressed these candidates as ”Part of Delhi Police” and informed them that now Delhi Police Deptt will be taking these candidates along with them to various schools to train school students. Candidates were very happy and said they are thankful to Delhi Police and Dwarka Hello Moms Centre, who took this great initiative to impart such important training to them free of cost. Mrs. Raji Kurup, President of Dwarka Hello Moms was very pleased to see the utmost change in her shy students to a confident and smart one now. She thanked Delhi Police Department who were really taking utmost care in seeing women and young girls to be self sufficient and handle themselves in any situation and not remain silent. This venture by Delhi Police should be continued and every student should teach every girl child in the area. Raji Kurup also mentioned that her center will be conducting these self defense classes regularly every Sunday for two hours by the students who have been trained and certified which will help them not to forget and also a new lot of women are also prepared for any eventuality. Mrs. Sawhney, Vice Principal of Govt School, Sector -22, Dwarka also gave a very useful speech to the enthusiastic students. In last patron of Dwarka Hello Moms Lt.Col.B.S.Sharma (Retd) told the candidates that their ”look should always speak”. They must always carry a strong look, sufficient to tell any miscreant that you are not a coward or weak, you are a brave one, and can give back well. He also advised them that they have to keep spreading this skill in a mushrooming way, from one to another, so that it is gained by each one and spread every where. 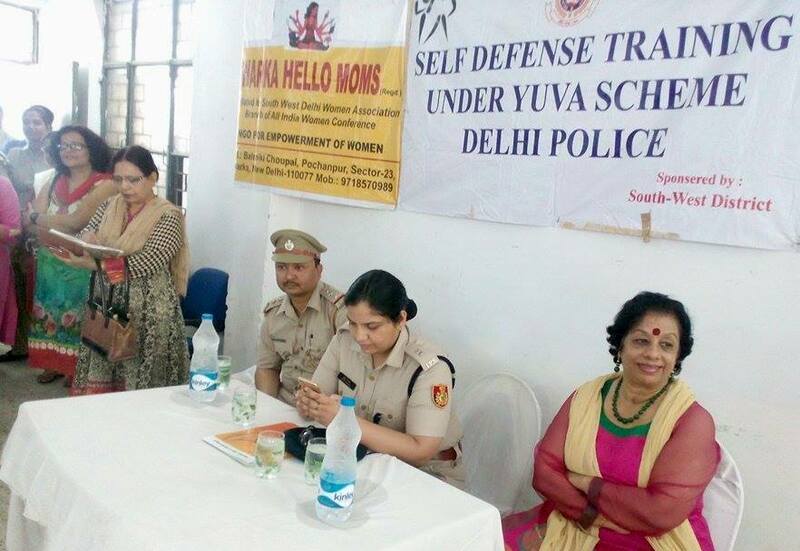 He also appreciated this initiative taken by Delhi Police and congratulated Dwarka Hello Moms for their successful Self Defence Programme organized so well at their Centre. Ms. Natasha and Ms. Nisha Sehrawat, candidates who completed Self Defense Training from DHM Centre, shared their experience and said that ever since they joined this training programme, they have become more confident and brave. They said that now they find themselves able to handle or tackle any situation. They also told that now not only they will continue their this Self Defense practice, but also teach this skill to other women candidates around them also. In last they said that they are very much thankful to Delhi Police and Dwarka Hello Moms for giving them this training so nicely without charging any fees. They said that they feel proud to be a student of Dwarka Hello Moms Centre.